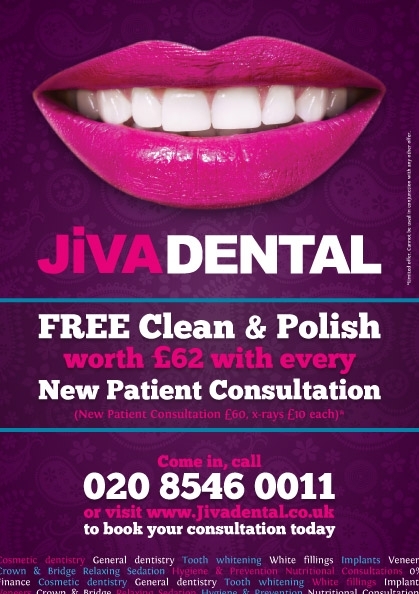 With every New Patient consultation we are offering a FREE clean & polish (worth £62)! 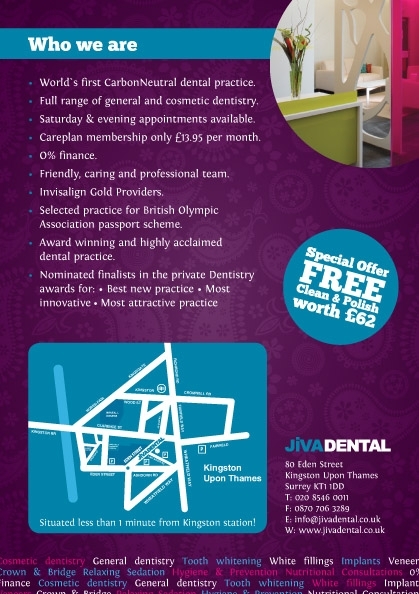 Professional teeth cleaning services at Jivadental in Kingston Upon Thames. So, what are the benefits aside from cleaner, healthier teeth and gums, great oral hygiene and fresh breath? We’ll reveal our findings and (if you wish) take you on a photographic tour of your mouth! In addition to your daily teeth cleaning routine we recommend our patients see our dentist at least once every six months to ensure any problems are picked up before they become a problem to you, helping you to maintain a smile to be proud of! To book your new patient consultation please pop in, call 208 546 0011 or fill out a contact form.